March 2009 – Linda I.
I started stamping in 1997 at a Stampin’ Up party. Learning how to emboss was fascinating and hooked me. I still enjoy Stampin’ Up products, but many of their stamps are too cute for me now. I have to say that being nominated for Stamper of the Month is such an honor and I really appreciate this group. You are so supportive and willing to share and help each other. One of my favorite techniques is working with alcohol inks to make backgrounds or decorate paper. I also like to use watercolor pencils and paint for coloring. When I want it to sparkle, I use sparkling H2Os. Hard to say. I have a ton of stamps and enjoy many different companies. For oriental art I have to say the OSA vendors are superior. I am really enjoying the unmounted stamps. They are easy to use and don’t take up so much room to store. 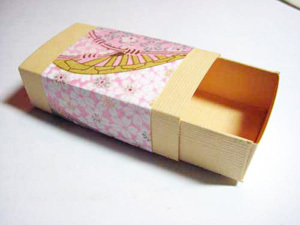 I love the Kodomo brand, but have lots of others like Art Neko, About Art Accents, Inka and I love them all. 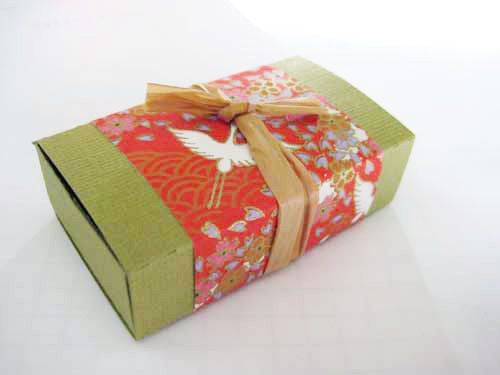 I like using decorative papers and various punches. Warm colors. I love brown with pink or blue or green. I like using embellishments and have a large variety of them. For oriental cards I like the coins or charms. I guess I use eyelets and brads the most. Paper cutter is without a doubt what I use the most. It’s such a time saver especially when doing multiple cards for swaps or for my stamp club. I also couldn’t live without my two-sided tape. It works better for me than the roll on double stick tape. Glue dots are great too. I think the thing that makes creating easier for me is having a designated space for it. I try to be organized and keep things close at hand. Although I do spend time looking for things sometimes (I guess there’s no getting away from that). I keep all my oriental stamps together and unmounted ones together. On my desk I have my paper cutter, tape, embossing gun, light, decorative scissors, colored pencils, brushes and a craft mat to work on. In a bookcase close by I have all my stamps in drawers and embellishments in drawers. My computer is also in the room and I have a lot of ideas stored in folders that I can refer to quickly. I have always enjoyed oriental art. Its simplicity is calming. I would love to go to Japan and soak it all in. It’s such a different culture and art is big over there. I don’t know what supplies I could get there, but I’d sure get some great paper! I belong to a local stamping group. We meet once a month. The hostess picks the themes for three projects and when we meet we each make the projects of each other. We have been doing this for several years now. Besides making great art, we also feed each other. I am a member of Split-Coast Stampers also. My favorite magazine is Stampers Sampler because they put so many samples in each issue. I also enjoy Take Ten, VSN and Paper Crafts. I have been published twice. Both times in Stampers Sampler. Being an art minor in college I have many interests. I like to paint, do woodworking, work with clay, quilting, sewing, and cooking. Being in a local group of stampers keeps me motivated. I also enjoy being involved in swaps thru OSA. There is a stamp store in town (The Stamp Art Shoppe) that is wonderful, offers lots of classes and has inspirational samples. Yes, I taught art for 18 years at the high school level. Art was my minor in college. I have always enjoyed it and enjoyed teaching it. Of course. I can think of a few. Buttons, bottle caps, hardware knick knacks, cookie cutters, bubble wrap, post-it notes, charms, beads, playing cards, q-tips, corks, etc. No, I recently retired after teaching for 34 years. I am enjoying the less stressful life I’m living now. I live in Roseville, CA and I have two children. Both have left the nest and are making it on their own. My daughter, Stephanie, lives in San Diego and is a hair stylist. She’s very creative and artsy. My son, Dave, is married and lives closer to me. I see him and his family often. I am a grandma of two (a boy and a girl) It’s the best job I’ve ever had. My grandson, Kai, enjoys playing in my craft room. He has potential for being creative. Oh, and I have 3 cats. They are a lot of company to me. Baby is always in the room with me. Usually sitting on the floor behind me. Sophie likes to jump up on my work table and see up close what I am doing. Many times she just misses stepping in the glue or whatever. My third cat is an outdoor cat. Make a matchbox using a diecut pattern. 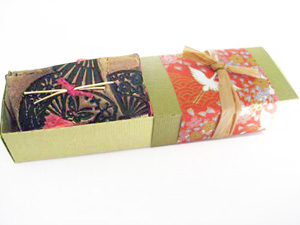 Fold it and tape it into the matchbox shape. 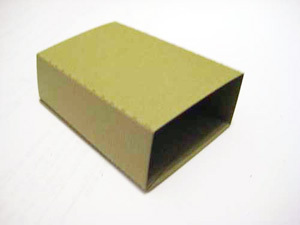 Using a decorative paper, cover the box with a strip that measures 1 ¾” wide by 5” long. 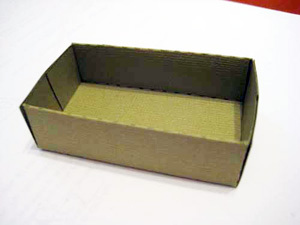 Tie the box with a piece of raffia. I tied it with a double knot and clipped the ends so they were even. 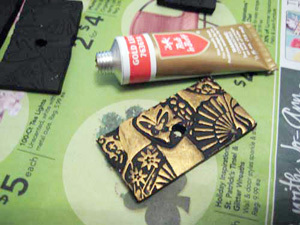 To make the pin, start with some polymer clay (black) and roll it out to about 1/8” thick. 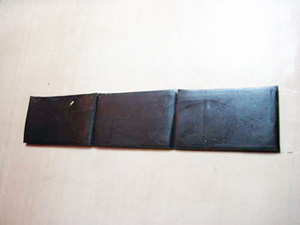 I used a ruler to cut the pieces about 2 inches long and an inch wide. 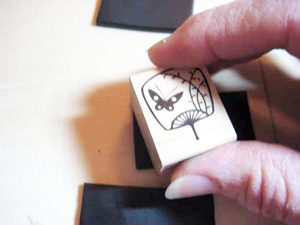 I chose some fan shaped stamps to imprint images onto the polymer clay. Press the stamp into the clay firmly. 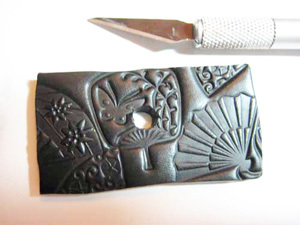 If the polymer clay changes shape, trim it with a craft knife to give it a straight edge again. Use the knife to also carve a small hole into the center. Bake the clay about 30 minutes at 225 degrees. 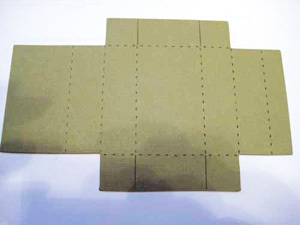 After they cool you can scrape the edges if they are rough or make the hole bigger if it’s not big enough. 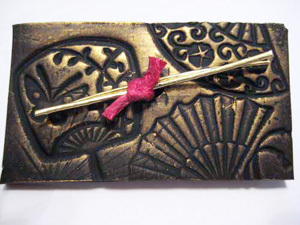 Using “rub n buff” (gold) decorate the top of the pin. Put a small amount on your finger and spread it across the top of the pin. Let it dry. 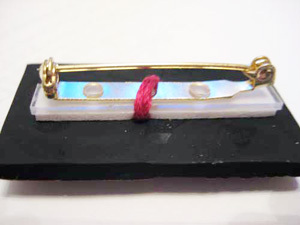 Using a strand of fairly thick yarn or string tie the pin back to the pin and bring the string up through the hole in the center to the front of the pin. Place 2 lenghts of mizuhiki cording (about 1 1/2’” long) over the front of the pin, then tie the string around them. Make a double knot. 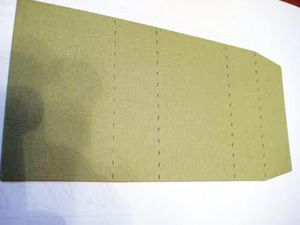 This will keep the pin back in place and will keep the string from going back through the hole. Now you have a pin and a small box to put it in.